This single signature book has a wallpaper border cover. The text of quotations was written out with Zig markers on white text weight papers. 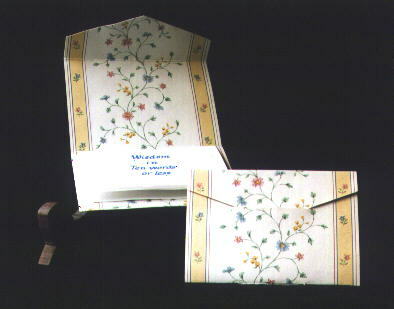 The cover was folded back on itself and glued to show pretty colored floral pattern on both the inside and outside, and creating a cover with strength. The closure consists of a slit with flap tuck-in. Beth Lee, 1992-2007. Last update August 12, 2007.